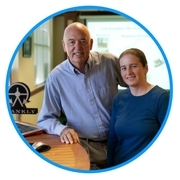 “Banshee” is a true story of an incredible adventure. It was written to help inspire people, young and old, to follow their dreams and never give up. 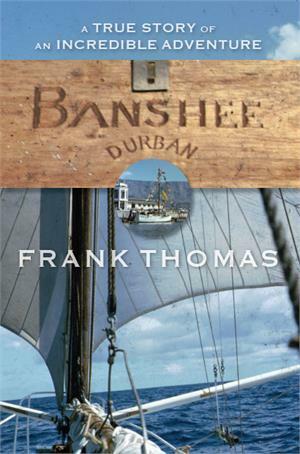 In 1962, two young men with a big dream to sail around the world left Durban, South Africa in their 25-foot sailboat called Banshee, the smallest boat to have attempted this journey at the time. This story charts the adventures of Frank Thomas and Malcolm Maidwell as they attempt to navigate — without assistance from today’s modern technology — the treacherous waters around the tip of Africa (aptly named, as they would find out, “The Cape of Storms”) and make their way across the Atlantic Ocean. 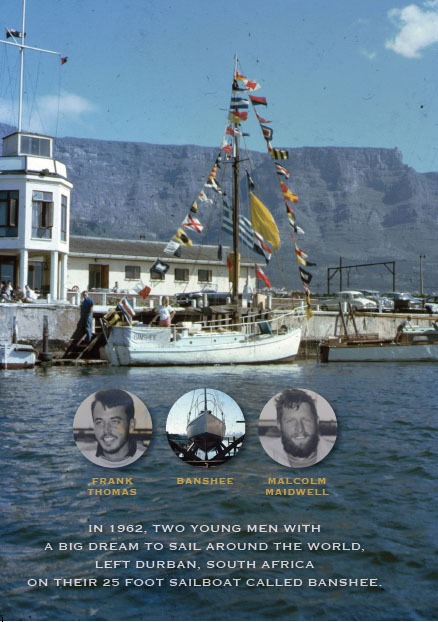 This was an ambitious plan, bearing in mind their only previous sailing experience was on the small, landlocked Cinderella Dam near Johannesburg. In this coming-of-age story, they and their 34-year-old yacht had several troublesome encounters and made eye-to-eye contact with death more than once. With a stubbornness and will to continue they pursued their dream against the odds, relying on their belief that their small boat was up to the task, and faith and trust in each other. Guided by fate and a game of matches, this journey shapes the future lives of these young men as they experience exhilaration, exhaustion, excitement, romance and extreme fear along the way. Having total faith in their diminutive guardian Banshee, they stepped into the dark without knowing exactly what to expect but with a naive belief that they were invincible. “Banshee is a wonderful true tale of adventure, passion, danger and accomplishment. I would encourage everyone to enjoy this glimpse into the lives and minds of two real explorers”. "One of the truly great adventure stories. Frank Thomas keeps us clinging to the rigging on a grand voyage of discovery and survival that is simply spellbinding. Can't wait for the sequel!"